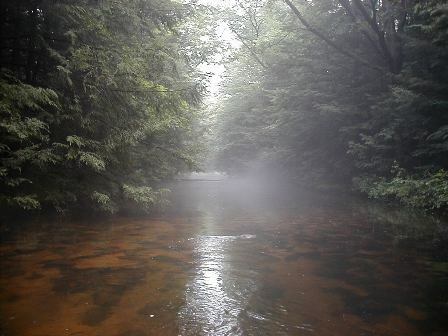 My name is Derek and I discovered the beauty of Stony Valley, a large forest just east of Harrisburg Pennsylvania, while on a weekend hike along the Appalachian Trail in the mid-1990's, shortly after moving to eastern Pennsylvania. I was born and raised in New York City and found the solitude and tranquility of The Valley to be like nothing else I had ever experienced. Over time the frequency of my visits to Stony Valley increased and hiking turned to mountain biking. During the earlier years I commuted daily from my home in Pennsylvania to New York City and by the end of each week I needed to recharge my batteries. Stony Valley rejuvenated me. From then onward, every year from April through October, I'd mountain bike Stony Valley on as many Sundays as possible. Its seclusion (on most rides I would not see anyone) was a welcome blessing following a long week in New York. After a week of riding the subway with a million people, The Valley added balance to my life. I'd bike the old railroad trail that runs from Goldmine Road through the forest to Dauphin. The length of the dirt path is between 17 and 19 miles (to this date I still can't get an accurate distance since my GPS frequently loses signal). The slight grade makes it a bit of a challenge returning back to Goldmine and the round trip of about 35 miles feels like an accomplishment. I knew nothing about the region or its history and I did not know anyone in the area. Other than knowing that Harrisburg is to the west, I had no knowledge of the surrounding towns and communities. I was a reluctant participant in saving Stony Valley. My involvement began back in 2003 or 2004 (I honestly do not recall which year), when I met a gentleman named Jim Rice. I'd see Mr. Rice, nearly every weekend, either at the Dauphin or Goldmine end of the old railroad trail. At that time he was asking the handful of visitors (hunters, bikers, hikers - anyone really) to sign a petition about saving The Valley. To be honest, I did not fully understand what was at stake, I was just there to bike and go home. Unfortunately most of the time he would collect only a handful of signatures. (And to be accurate, there were a few other men, in addition to Mr. Rice, who handed out information - unfortunately I don't recall their names.) After several weeks of seeing his dedication, I was impressed. It wasn't too long until Mr. Rice asked if I would help. I didn't know what to say to him. I said that I did not live in the area and I had no idea what I could do. He explained to me that the military base (What? There's a military base nearby?) wanted or needed additional land and that there were plans to take land from The Valley in exchange for land in another area - it would be a land swap, aka "The Swap." Is there really a military base nearby? It's true, I had been biking in Stony Valley for years and I did not know there was a military base! It's called Fort Indiantown Gap, aka "The Gap." Mr. Rice gave me some information to take home. After reading it I still wasn't sure how I could help. I am a programmer and a photographer and I could not imagine what I could do to help, plus I was hesitant to get involved. I lived about 100 miles away and had little time, if any, during the work week. But it didn't take a rocket scientist to understand that if I didn't help save Stony Valley, it may not be around for me in the future. But what could I do to help? Mr. Rice had no suggestions either. I had been doing web programming for my company and it occurred to me that a website could be set up to help fight The Swap. I registered and set up www.savestonyvalley.com - this site - and Mr. Rice gave me a CD of articles. I spent quite some time laying out the message of the site and organizing how the information should be conveyed. Other than Mr. Rice and the few men I had met while biking The Valley, I did not know if anyone else was involved in the grassroots effort to fight The Swap. I updated the website every week with new information about Stony Valley or The Swap. I recollect a few articles in the Harrisburg press and most of my information came from Mr. Rice. I was neither for nor against the military (we need the military, I watched the World Trade Towers burning from my office windows), just against The Swap and occasionally I'd write something that ruffled some feathers. I remember one instance, I received a call from Mr. Rice while at work in New York about something I had posted. It had to be removed ASAP. Apparently The Gap monitored the website. In early 2005 I had learned that saving Stony Valley was not a new effort. Decades earlier there had been a prior effort to save Stony Valley from either a power company or utility. I learned that the success in saving The Valley in the 1970's was a legendary tale and still well respected and admired. It was around this time that I learned of Dale Ibberson. If my memory is correct, Mr. Ibberson was the treasurer of the group that saved Stony Valley in the 1970's. Much like Mr. Rice, Mr. Ibberson was also involved in stopping The Swap. However, as with most organizations or groups, things happen very slowly (a snail's pace really) and unfortunately it did not take long for Mr. Rice to grow impatient with Mr. Ibberson and the reformation of a group that had been inactive, dead really, for nearly 30 years. Shortly thereafter, Mr. Rice decided that he would no longer be involved with Mr. Ibberson's group, telling me on one of our last telephone calls that "all they do is have meetings about having meetings!" I understood his frustration. No one from Mr. Ibberson's group contacted me about the website and Mr. Rice's departure left me as chief cook and bottle washer with respect to the website. Not exactly what I had in mind. I knew The Gap was monitoring the website and I knew that Mr. Ibberson was working against The Swap; if I could get him to use the Save Stony Valley website on all of his literature and signs, then I could do more with the traffic coming to the website. 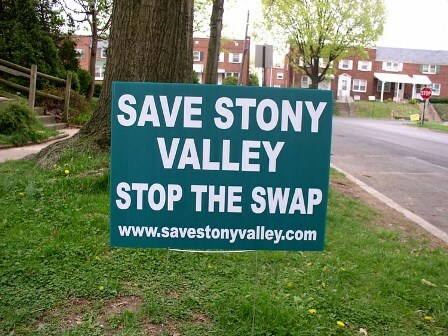 Luckily, that happened and the now famous Save Stony Valley lawn signs went up all over the place. While I had very little communications with Mr. Ibberson, I tracked the website statistics and knew people were visiting it frequently. Then it hit me, I realized I could program the website to automatically email letters to state senators, representatives and Governor Rendell. After a couple of dozen hours of programming and research I set up the website so that a visitor had a selection of stock letters that could be edited. A website visitor could even write their own letter. Then, with the click of one button, he or she could send their letter to one or more of the politicians. It was that simple. Each email letter had the name and address of the sender. It was far more efficient than Mr. Rice's efforts at getting signatures on a petition and it could produce immediate results. At that time my website could send each letter email to between 10 and 15 representatives and senators. I kept track of the count of emails. I also allowed website visitors to register with me and over time that list grew to a couple of thousand names. The devoted effort of many individuals, spending hours after work and on weekends to hand out flyers, signs and information helped spread the word about The Swap. Every piece of information that was handed out had the website address. As the email count grew and as more and more people registered with my website I began writing email newsletters. I emailed them to the email addresses I had accumulated, and urged people to forward the newsletters to friends and family members. It only takes a few seconds to have your voice heard! Government only works if you get involved! -- How ironic, I had gone from being a reluctant participant to being someone who was directly telling thousands of others to get involved. And it worked! With every passing week the email count increased. I monitored the emails to determine if the representatives and senators had blocked the accounts. I spent quite a bit of time making sure that the government knew there was a large number of citizens who opposed The Swap. Other members of Mr. Ibberson's group organized outings and events which helped spread the website address. Unfortunately I had no other contact with Mr. Rice. Handling all of the information on the website, the emails, the updates and news took a considerable amount of my time. My contact with the others involved in saving Stony Valley grew too. Many welcomed me with open arms and I began to feel as though Stony Valley was my second home. So many men, women and children stood together to fight against The Swap. Most impressive was that hunters, hikers, bikers and birders came together, unified to prevent the loss of their treasured wilderness. Even though the website cost money to maintain and took up my time, it was the right thing to do. I also donated money for raffles and paid to print flyers and other literature for Mr. Ibberson's group. 2006 - Stony Valley Almost Saved! By 2006, roughly 30,000 emails had been sent through my Save Stony Valley website to local representatives and other state officials. I was amazed. 30,000 emails gets noticed - no doubt about it. The Swap became a hot button issue and politicians knew that if they sided with The Gap they may get voted out of office. The hard work was paying off and Mr. Ibberson's group got an opportunity to meet with Governor Ed Rendell to discuss The Swap and in order to find a compromise solution. I believe those 30,000 emails played a major part in that meeting. The Swap was in limbo and The Gap was doing damage control. Everything has consequences. All of the publicity to save Stony Valley resulted in more and more people using the old railroad trail. What had once been a solitary bike ride for roughly 35 miles was now like biking through the park. Ironically, to save The Valley we had to change it. Perhaps the increased traffic led to The Gap or the Game Commission dumping more gravel along the dirt path (today it is part gravel part dirt). One or two members of Mr. Ibberson's group wanted to take control of my website and felt it should have more of a nostalgic "look and feel" with respect to the old group from the 1970's. I was told that local citizens would care more if the website had lots of references to the fight from the 1970s. I disagreed and 30,000 emails were proof people cared without hyping the old group. Hype is just hype! I felt honesty was better. Additionally, new members to the group, some who admittedly hadn't visited The Valley in years, felt I was an outsider - not from the area and just "their webmaster" with little interest in how much I had done. One or two wanted to exclude me because I was "not elected" in Mr. Ibberson's group to any of the leadership positions or because I did did not attend monthly meetings (it's difficult getting from New York City to Harrisburg on a work night and be back at work in New York City the next day). According to one of the group's members, my participation with Mr. Ibberson's group was at a "very low level." And reducing my role to "the webmaster" was quite offensive. There was talk about using the website to fight windmills or to post information about the Appalachian Trail. I was now at odds with some people who had welcomed me with open arms. Few recognized the impact of 30,000 emails and my efforts, I was now in the way. I never asked Mr. Ibberson's group to reimburse me for the website costs or my time. I never received receipts for my donations to raffles or for paying for flyers or literature, even though Mr. Ibberson's group was a non-profit organization and I could have easily saved on paying the tax. With the down turn in the economy I was unable to pay the website hosting fee in 2010 and the website went offline for a short time. Unbeknownst to me, some members of Mr. Ibberson's group (sadly Mr. Ibberson had passed away) contacted the web hosting company and tried to take this website from me; they filed papers saying I was not authorized to have it and that I was merely their webmaster. Luckily they did not succeed and I can tell my story about saving Stony Valley. We all Saved Stony Valley. We all played important roles - Mr. Rice, Mr. Ibberson and his group, the citizens and me and my website. Working together we did this. The grassroots effort brought many different people together, young and old too, to successfully save a treasured wilderness for our generation and the next. Keep in mind that Stony Creek / Stony Valley is in State Game Lands. As such, you must follow the rules. It is unlawful for non-hunters to be present in Stony Valley from November 15 through December 15 without wearing at least a Fluorescent Orange hat. Orange material must be visible from 360 degrees. You may not ride bike or horse from the last Saturday in September until the third Saturday in January, and prior to one hour after close of lawful shooting hours for spring turkey season from the second Saturday in April through the last Saturday in May. At various times The Gap collects ricochet fragments or shells in the region. They are very good about putting up signs during these times. I've been informed that The Swap is on hold and likely never to happen. We must never let our guard down. The events that I have described above are my recollections and my experiences. Many people played important roles in saving The Valley and I do not wish to minimize their involvement by not mentioning their names. Please forgive any omissions. I'm sure my accounting of Saving Stony Valley will offend some because I have presented it as it unfolded from my perspective. As I said above, we all saved Stony Valley, our success was not a result of a lone person's actions. I am very proud of what we did. More about me plus my photographic work can be seen by clicking to Derek Jecxz (www.jecxz.com). I still bike the old railroad path most weekends as of 2010. There are more visitors than there were 10 or 15 years ago. During one ride I was resting at the gate on the Dauphin end and I began talking with a couple. The wife said, "Glad we didn't lose this land." Not sure if she was referring to The Swap I said, "What do you mean?" The husband said, "The Gap was going to take away this land. There was a website where you could send emails." I said proudly, "I set that up!" The wife's eyes widened and the husband said, "I want to shake your hand. Thank you for what you did. My friends and I sent emails through that website." I took off my biking glove and shook the man's hand. I was honored and moved.